With the Original Broadway “Carmen Jones” Cast, Frank Sinatra, Dinah Shore, Garry Stevens, Dorothy Kirsten, Claire Chatwin, Mary Mayo, Edmund Hockridge, Ella Fitzgerald, Doris Day, Perry Como, Shirley Bassey. Featuring Songs from Carmen Jones, Allegro, South Pacific, The King And I, Me and Juliet, Cinderella, Pipe Dream, Flower Drum Song, The Sound Of Music. In Part I of “Oscar-Winning Words” catalogue number (SOY 2099) we told the story of Oscar Hammerstein II’s collaboration with composers, Sigmund Romberg, Jerome Kern and Richard Rodgers. In Part II we continue with Hammerstein’s partnership with Rodgers. 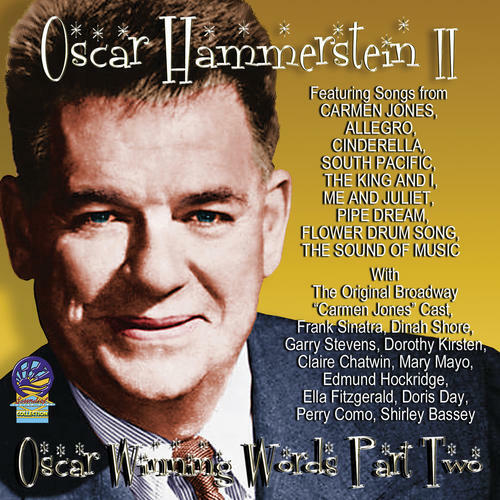 We hope you will enjoy this two-part tribute to Oscar Hammerstein II who died on August 23rd 1960, leaving us a legacy of lyrics about every subject under the sun. He won a Pulitzer Prize for “Oklahoma!”, a Donaldson Award for “Carmen Jones” and “Carousel”, and Academy Awards for The Last Time I Saw Paris and It Might As Well Be Spring. Hammerstein’s real talent was for the big theatrical gesture, first notably in “Show Boat”, and the power of his writing was enough to change the character of Rodgers’ music, and perhaps help to create what is arguably one of the best song writing collaborations in musical history.